Get Geeky And Do Good! Want to make a difference as a Geek? This fast, fun, free guide will give you a range of ideas to try - and lists of organizations and resources to help you out! Promoting Space Travel or promoting literacy? Cosplay for good - or run a fix it shop? Whatever you could do to be a geek citizen is here and then some. Grab the book, get an idea, and get to work! Best of all, the book is free! 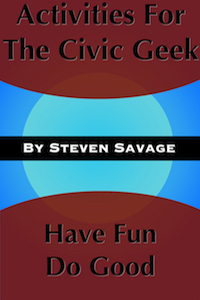 For even more resources, check out www.CivicGeek.com!